Rococo elegance made modern. A focal point for any room in which it lives, our Rococo Chaise is at home in your Mexican outdoors as well as in your living room or large bedroom. A focal point for any room in which it lives, our Rococo Chaise is at home in your Mexican outdoors as well as in your living room or large bedroom. 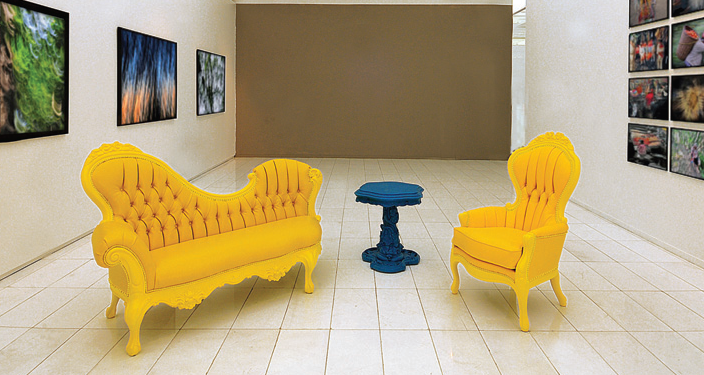 These Mexican furniture pieces would certainly have made Mr. Liberace proud! Made of polymer resin (read: forever durable) in a variety of colors. Your Mexican outdoor patio, living room or bedroom will never be the same again ! Price and dimensions listed are for Sofa/Chaise Lounger. Side table and Armchair also available.